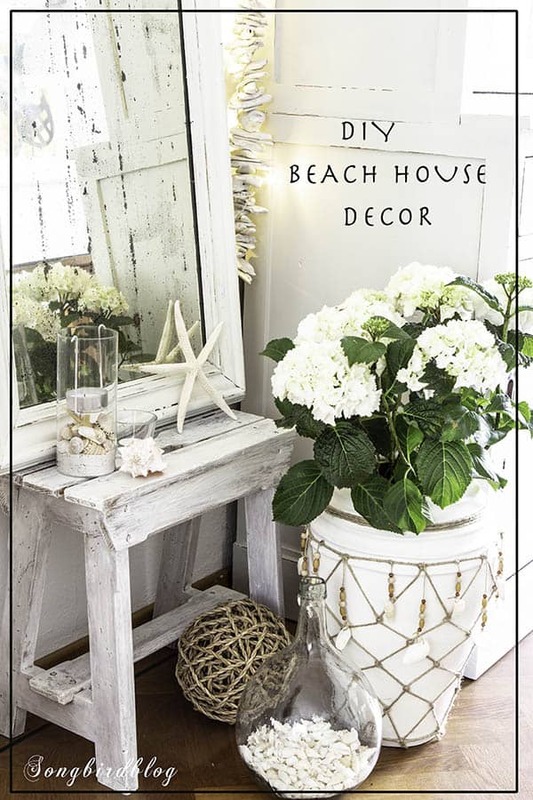 DIY beach house decor project today! It is weekend y’all! Isn’t life wonderful, it is weekend, it is officially summer, the sun is shining and I have a new little nautical decoration to show you. Life is good indeed. Remember that vase, that used to be brown and that I hesitated about altering? Well she’s received her third outfit since she went all white. Today, she is wearing fishnets…..
Well one fishnet and with a bit of bling added. Normally I am not that much into fishnet stockings. A bit too racy for my taste, but I must say that my white beauty is pulling them off with honors. She knows how to work those fishnets! Funny how such a small change to an otherwise rather plain vase can make such a huge difference. I had envisioned it in my head, but until I finished it I wasn’t sure if I could pull it off. And now I am in love with my nautical fish net decor. I used the excellent tutorial by crafter and decorator extraordinaire Craftberry Bush to figure out how to make the fishnets. It did. In my first try. I had to adjust a bit for the tapered bottom of my vase. But in the end that just meant pulling everything extra tight. And then the really fun part began: embellishing her with beads and shells. With our regular drill and a tiny drill bit I made holes in the shells. None broke to my own surprise although those buggers are surprisingly hard. And then it was a matter of stringing and tying. I love those dangly bits, they add just that bit of extra oomph. If she wasn’t a vase, I am sure my fishnet wearing beauty would be shimmying and belly dancing and making those dangles swirl. I moved one of my beach lanterns to this vignette. I think she belongs here (and having the mirror behind the candle light is an added benefit). My driftwood garland I made for my beach mantel from two years ago has found a spot again too. I added a string of shell lights from the dollar store, and now she lights up this dark corner very nicely. Another little corner of my home all ready for summer. I think project summerification is nearing its end. And that’s it, it is weekend. Let’s play. For us that means some working in the garden, some more puttering around the house, maybe bake a banana bread or something like that, watching a bit more football (=soccer). Going to a farmers market, having a pizza lunch and making sure we do at least a couple of hours of nothing. Wow Marianne, your vase is rocking her fishnet and dangly bits. I’m loving your summer home and coastal accents too. She is sure rocking it. I love how this project turned out exactly as I saw it in my head. Doesn’t happen often…..
Veel plezier met het maken van visnetten.